Pictured from left to right are City Councilman-elect Robert Cornegy, P.S. 308 Principal Dr. George Patterson and P.S. 308 PTA President Lawana King. There was a time not too long ago that P.S. 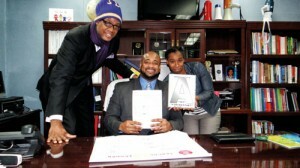 308’s Gifted and Talented (G & T) program was a source of pride to all of Bedford-Stuyvesant. Neighborhood kids that passed the entrance exam and attended the school, and their parents, were lauded on the streets and in the churches as accomplished individuals within their community. But then the Bloomberg Administration took over the Department of Education in 2001, slashed P.S. 308’s budget in 2008, took away the Gifted and Talented program and put a charter school on the third floor. The many academic and chess trophies the school had won over the years were boxed up and put in the basement, and along with it, much of P.S. 308’s long distinguished history of educating Bed-Stuy’s brightest young minds. Meanwhile, with no G & T program in the community, local students that passed the G & T exam were taken out of the neighborhood to attend the G & T program in other communities around the city. This may soon change, however, as incoming City Councilman-elect Robert Cornegy and P.S. 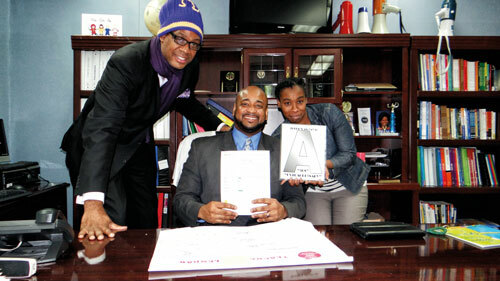 308 Principal Dr. George Patterson are determined to bring the G & T program back to the school. “It’s a travesty of what happened to the good schools in this community, and putting a charter school in P.S. 308 was a slap in the face,” said Patterson, whose father, Oliver Patterson, was a leading Bed-Stuy educator and civil rights activist for many years. Patterson recalled how former P.S. 308 Principals Dr. Evelyn Castro and Dr. Gail Bell-Baptiste ran both the G & T program and the school successfully for many years. However, when Patterson took over the school a year and a half ago, it received a D grade on the city’s annual report card. Patterson immediately brought the trophies up from the basement and put them in a glass case at the building entrance, and with the help of a dedicated faculty, the school received an A on their report card released just last week. Patterson said several school staff members understand how the G & T program works and have the skills to prepare the young students to prepare for the test, in which students must score 90 or better to get in the citywide G & T program, which is for kindergarten to fourth grade. Poverty has a lot to do with kids getting into the G & T program, as you have to bring up the emotional intelligence, he said. Cornegy, whose wife was in the G & T program at P.S. 308, said he envisions the school becoming a pipeline for Bed-Stuy’s G & T children throughout the district. Cornegy said he also spoke with the National Society of Black Engineers (NSBE), which ran a very successful and well-attended mentoring program this summer, and they expressed a willingness to mentor some of Bed-Stuy’s G & T children. Both Patterson and Cornegy also want to improve the special education program at the school as well, and sees the G & T program running in a more integrated way. Entrance to the city’s Department of Education’s (DOE) Gifted and Talented programs are based on verbal and nonverbal assessment tests given to children as young as four. This year, there are 34 Gifted and Talented programs at schools in every Brooklyn district except District 16, which is made up mainly of Bed-Stuy. District 20 schools, which are mainly made up of Bay Ridge and Bensonhurst, have 10 or slightly less than a third of the borough’s Gifted and Talented programs. This includes the Brooklyn School of Inquiry, which is one of the city’s five magnet Gifted and Talented schools drawing children from across the borough and city. Seventy-five percent of the students attending this school are white and 13 percent Asian, six percent are black and six percent are Hispanic. Department of Education (DOE) spokesperson Harry Hartfield said two weeks ago the reason Bed-Stuy didn’t have any Gifted and Talented programs were because they lacked the students that could pass the test. Hartfield did not return repeated requests for more information on the number of Bed-Stuy students that passed the G & T exams and now attend a program in another district. Hartfield also failed to answer any questions about P.S. 308 at deadline.